The final throws of the regular season have been thrown. After three months of competition, teams have had a chance to make their case for earning a strength bid. We entered the final weekend with plenty of possibilities, and, thanks to some rising and falling fortunes, some of the more unlikely ones came true. If every team’s season is a hanging throw, let’s find out who caught it in the end zone, who completed it to the warning track, and whose regular season is laying in the dirt. Northwest Challenge was an event filled with shocking performances that will shift the landscape of the division heading into the postseason. It did not, however, shift any bids. There were close calls and plenty of teams shifting around, but the bid counts look the same coming out of the weekend as they did going in. The three teams that had to protect their property were UBC, Stanford, and Oregon. All three were cooking with gas to start the tournament — they went 7-2 through their first nine games. Fugue scored impactful wins over Washington and Pittsburgh that put them in a favorable position. That perch was high enough to survive blowout losses against WWU and Stanford to end the weekend. British Columbia beat the four highest ranked teams at the tournament and reached the final to more than assure they would earn a bid. And Stanford’s late win over Oregon did a lot to help lock up their position. In fact, the chaos of the weekend actually insulated the haves against the have-nots. Dartmouth, UC San Diego, and Pittsburgh spent the weekend redistributing their rankings point wealth among the other teams already safe. The only exception was Washington, the only team in Tier I without a bid and with a shot at one, as they lost to Pittsburgh twice (and were hurt by a loss to Stanford), though even they took plenty of points from Dartmouth. 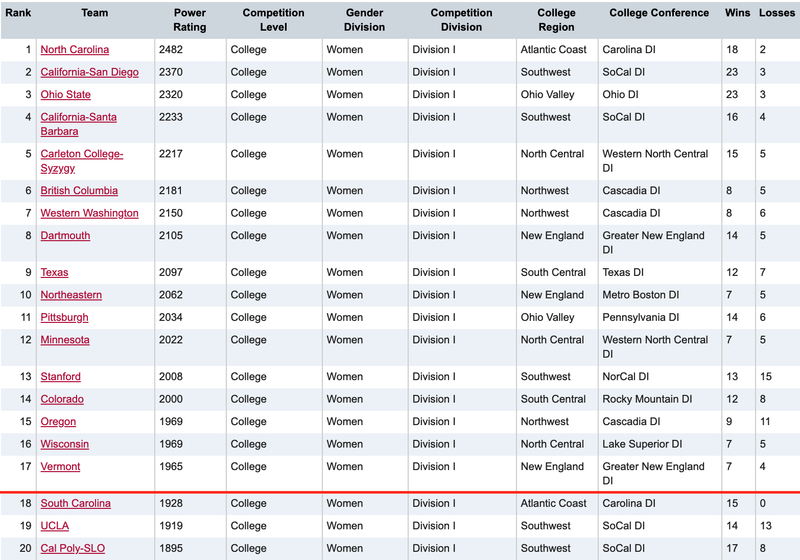 Idle hopefuls like UCLA, Tufts, and UNCW had to watch teams at the top donate points to the teams at the edge, increasing the gap between at the border. South Carolina wound up as the first team out, not that close at 40 points away. Of course, they were not at Northwest Challenge either, and did the best they could at I-85 Rodeo, capping off an undefeated season against low and middle competition. Surprisingly, both the winners and losers are the regions with three bids. A three-bid North Central has felt like a possibility that would just never come true. New England scoring three without the help of Tufts? Also a big win. Vermont’s very thin resume was enhanced by Northeastern’s success at Centex and Western Washington’s high position. And despite the surprises on paper, all of the bid-earning teams feel like nationally competitive teams. The losers have to be the Northwest and Southwest, despite winning the same pair of strength bids as the NC and NE. Four of the first six teams out of the bid cutoff are either from the Southwest or named Washington. The perceived strength of these two powerhouses regions is quite high, though perhaps not as towering as it was to start the season. Whether or not the Atlantic Coast belongs on either of these lists is in the eye of the beholder. Two of the first three out are AC teams, and there are three more in the top 30. But coming up short has left them with one bid and mighty North Carolina the heavy favorite to hold it. While teams like South Carolina, UNC Wilmington, and Delaware have a lot to be proud of, they’re staring a stark April reality in the face. All eyes were on Myrtle Beach and Easterns in the Men’s Division, with plenty up in the air going into the weekend. With Ohio State and Central Florida both leaving the Huck Finn field,1 Easterns was squarely in the middle of the bid conversation. Two teams that traveled to Easterns with bids returned home empty-handed: UNC Wilmington and Auburn. Both had disastrous tournaments. Auburn started 0-3, and lost rankings points in four of their six games, capped off by a losing 40+ rankings points in a losses to UCSB and Georgia to close the weekend. Wilmington, playing without Rick Hennighausen and periodically Matt Ellis, sank precipitously. They took losses to Northeastern, William & Mary, Northwestern, and Harvard, four of the lowest ranked teams in the field, and finished dead last. One of the donated bids wound up in the hands of Minnesota. Their situation looked dangerous after an early 13-5 loss to Oregon pushed them even further away from earning a strength bid. They slid a little further with a close loss to UMass. But Grey Duck rattled off four straight wins, three coming by significant margins, pulling themselves back up into position. After a rocky season, with their backs to the wall, the ducks managed to swim upstream. The other vacated spot came down to the postseason math. Tufts and idle Colorado State were separated by just a few points for the final strength bid when the weekend ended, with Colorado State looking favorable. 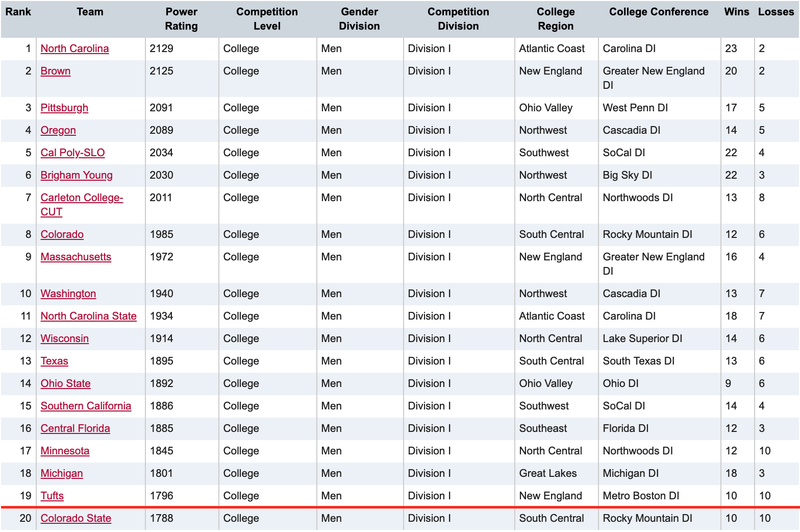 But in their final rankings, USAU began pulling out the results that would be thrown for various reasons. Those effects were enough to shift Tufts back ahead of CSU. The end of the regular season also brought the Atlantic Coast some heartache. On the back end, their third bid slipped away as Wilmington was diced up at Easterns. Even their grand champion, North Carolina, was suddenly humbled. And throughout the season, the region’s compelling contenders left the crowd wanting. The Maryland hype train sold plenty of tickets but barely got out of the station. Virginia Tech never came together. Neither William & Mary nor Georgetown could repeat their 2018 success. Flashes for South Carolina, Johns Hopkins, and Virginia did not do enough to light up the path for the AC. Instead, the AC looks deep and the journey for the second bid looks perilous for its current holder, NC State. The Southeast failed to claim a strength bid, with both Auburn and Georgia underwhelming at Easterns. LSU remained mercurial and Emory fell back into obscurity. Despite the tremendous surprise that Central Florida’s success provided, they were let down by a region that seemed intent on sabotaging itself. While the region is a loser, spectators are winners, with a knockdown, drag-out brawl slated in the South. The Southwest and North Central are winners and relieved to be so. It wasn’t so long ago it looked like the NC could be saddled with just one bid, turning their Regionals into a cage match. But Wisconsin cleaned up at Centex and Minnesota closed out Easterns with enough juice to clear their path to Austin. Meanwhile, the Southwest is likely just glad to have any strength bids at all. It was dicey going into Trouble in Vegas, but USC held on. Of course, you can probably put the South Central on the losers list and New England with the winners, given the late-breaking adjustments. Tufts was not an early season pick to have a particularly strong year, and they’ll have to fend off the Vermonts and the Harvards to maintain their spot, but they have looked the part when they play their best game. Colorado State could not overcome their early season errors, while the depth of the region–six top 31 teams–didn’t have quite enough pop. Just add the SC as another potentially dramatic regional. Comments on "#Bidwatch: The Final Results [Div. I]"